Our life, a Jigsaw: Which language do you speak? It so happened that when Vansh started going to school here, he came across a lot of different children from different cultural backgrounds and speaking many different languages. It was kind of funny, though natural for a 6 year old to ask among one of the first questions he asked his friends or in fact anybody he met, was whether they know Hindi. Hindi, being his preferred and most used language of communication, he felt comfortable if he could express himself naturally to just one friend when the rest of the time he had to talk in English, which he can speak in though not spontaneous. Now the answers of his friends started fascinating him. While someone replied that they knew just a few words of Hindi because they spoke in Telugu at home, another child said she knew Spanish, another one said Tamil and a little boy moved to our complex a few weeks back who speaks Marathi. He told his Telugu friend that he knows two words “Annam tintinawa!” and formed a bond. Similarly he told his Spanish friend “Hola!” and yet another bond was formed. Which is why childhood is considered to be so sweet and innocent. J The fascination kept growing. Since he also displays interests in names of countries, where they are located, which flights operate via them (*rolling eyes*) and so and so forth, I got him a Children’s Atlas from the library. Now the Atlas is pretty cool for young kids in the sense that it has the very basic starting information which keeps kids occupied with the tidbits it provides and neat pull outs for every continent containing lots of information like the countries in that continent, animals found there, what’s manufactured, their flags and yes the languages spoken in the various countries. Oh my God! It was such a hit with him. 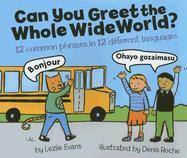 Most of all for the languages he got to know people speak in different parts of the world. So many new names he didn’t know exist. His conversations were so animated. He looked like a model child, any mother’s heart would swell with pride at, when she saw her child chatting with his grandfather in India on Skype with an Atlas open in front of him and saying “Nana, do you know they speak French also in Canada, so your so and so friend must also be speaking French, ask her!” I had also told him that my mom and dad were born in Pakistan (pre-partition), so he asked them what language is spoken there and learnt a few phrases in Urdu. During our conversations, looking at his interest I told him a few phrases of the different languages I knew, thanks to the song “Angrezi mein kehte hain ki I love you!” I told him I could say that in Bengali, Gujrati, Punjabi and boy was he impressed. (I didn’t tell him about the song though J) I threw in a few more phrases in German – Guten Morgen, Guten Naakht, and the counting eins, zwei, drei till zen. And he was thrilled asking me where I learnt all that from. I milked the opportunity like a true Desi mom and told him how I studied so much when I was a kid and learnt so many languages ;) So now when someone asks him how old he is he answers zecks and then proceeds to say that’s German for six. Showoff!! Ricky Martin came to help with his Un, dos, tres after which Maria has become his favorite song he keeps humming and claims of mastering Spanish. I got him a book yesterday from the library which has 12 common phrases like Hello, What’s you name, Thank you, Good Bye etc in 12 different languages and he devoured it with much delight remembering his bua from Dubai, checking that Arabic is spokem there and saying next time he meets her, he’ll greet her with a Salam and the friend in class who speaks Spanish with a ¿Cómo Estás? and the Tamil friend with a Vanakkam. At times, the scene is hilarious when four friends are playing in the park, two good at English, one at Hindi (Vansh) and the fourth one at Marathi. The two recently moved from India (the Hindi and Marathi speaking one), high on cricket take it upon themselves to teach the other two the game who have no clue how its played. So a lot of animated hand gestures, shouting out “no this, no this”, come “ikde”, “tu ye pakad” and everybody just trying to hurriedly tell everybody something in their language, we have a jolly good time, often times literally holding our tummies while laughing. Vansh - nee oru chakrai kutti. Romba romba samathu kutti paiyyan! Loved reading this. Vansh is growing up to be such a fine young boy :). You are doing a great job! So good to read this....its amazing how kids catch languages so easily we need Lavanya our telugu translater all the time...nowadays she's learning Sindhi with her Naani :). Great going Vansh. This is brilliant, Neera. No new phrases though, since I know only Hindi and English. Haan, here in Kolkata a popular greeting in Bangla is 'Kemon aacho' -How are you? Tulika: Thank u dear ...I love the opportunities and resources available here! Lopu: Ha ha ..thats the perfect phrase for Vansh to ask his Telugu friend he meets almost everyday in the park ..he'll be delighted for this one!